Story Massage, which combines positive touch with words, is now being used as a valuable way of exploring difficult emotions and encouraging children to understand and regulate their feelings. 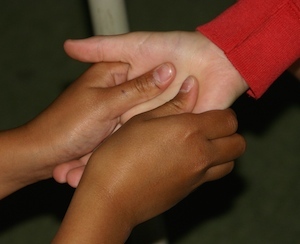 We introduce a massage story written to help children prepare for visiting the dentist. 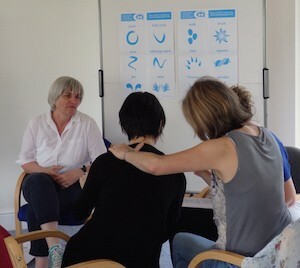 On our training days we teach the ten basic Story Massage strokes and then support you in using the strokes to adapt or create your own massage stories for children at home or within your work. We recently met with professionals from With Kids, a Glasgow based charity supporting children with difficult lives. Central to the work of With Kids are the core concepts of building self-esteem and the desire to “skill up” children and crucially also the carers of children. Fundamental to their many various projects is the value of each individual child and the power of love and care to transform their life chances. With this in mind, there was much lively discussion about the far-reaching possibilities of using positive touch activities to develop their work with the children and families in their care. 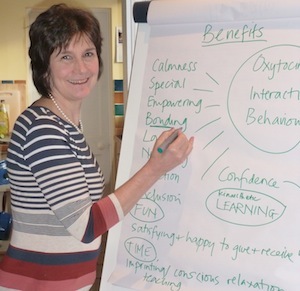 The group were particularly interesting in using the combination of touch and words as a way of understanding and exploring difficult emotions. This massage story, created on the training day, invites a child and parents to explore the range of emotions that may be experienced when visiting the dentist. It could easily be adapted for other circumstances where a child may have difficulties in communicating how they are feeling. We have made a short (60 seconds) video to demonstrate the actions. The words are written below.